Born in Paris in 1932, into a world quite different from today, Eliane Radigue remains an important, intriguing figure within the European musical avant-garde. She studied under Pierre Schaeffer, the architect of musique concrète, in the 1950s, going onto be an assistent for fellow musique concrète pioneer Pierre Henry. However, her own experiments—which included tape loops and microphones—were met with some hostility by Schaeffer and Henry and it became clear that her practice could not be contained by the inflexible principles of the founders. Max Dax: You grew up in Paris, in the direct neighborhood of Les Halles – the old market halls. I never saw them before they were torn down, but you have. What were they like? Eliane Radigue: The memory still lingers on. It’s pretty sad that they’ve destroyed not only this quarter but also this integral chapter of Paris. I lived on a street that doesn’t exist anymore. There is still a house with a plaque that says Rue de la Lingerie—that’s the name of the street where my parents lived, but that is all that’s left. There are many books about Les Halles—with old photos and corresponding texts. I ask because when I travel I always try to visit the big fish, fruit and meat markets to record the sounds—I do field recordings of the market criers and the environmental noise. Whether it is in Athens, in Los Angeles, in Rome or in London, these places seem to have a very specific sound. And since you deal with sound, with music and musique concrète, maybe you’ve noticed it as well. When I was younger, Paris only started to be alive at around midnight. Where I lived it used to be full of people selling vegetables and fruit and people yelling and all that. I remember when I was an adolescent, when I came back at night I had to cross all of that just to go into the house. It sounds like paradise to me. I mean, we are talking about real sounds that probably no one had thought to record back then. This would have been paradise for you, obviously, but honestly? I didn’t like it that much. Already back then there were a lot of tourists coming to Les Halles, just for fun. When I was a young girl these people were whistling my way which I disliked completely. I didn’t much like to live in this neighborhood. Of course, this place hasn’t existed for 40 or 50 years now. It has been transferred. You’ve worked with one instrument, the ARP 2500, over many years. I saw a TV documentary about you where you prominently say, “I have music in my head as an idea before I start”. Did you feel that you were at one with your instrument? … how I can get it out of the machine? To a certain extent, yes. Not at the beginning of course. I have been living with my ARP for more than forty years now, so it’s a very long marriage! At the beginning I had to be more careful but after a while it was quite alright. So it takes a long time for you to write a piece of music? Oh yes, it takes quite long. When I started to be more familiar with my instrument I made pieces that were of a very long duration, which, of course, could not be made in one move. This meant I had to prepare a lot in advance. The first move was to make some sounds where I could say, “this could be for the beginning, this for the end, this for the middle,” but after that it was made out of mixing and overlap, and a final piece would have at least thirty to forty elements to make the mix. What’s more, when I had made the first sounds for the piece I’d leave them for two or three months in order to listen to everything with a fresh ear—intentionally, to decide which to throw away and which to keep. Then, when I arrived at the final mix, it was a kind of climax because all the tape had to be ready and in a chronological order. From there I had to manage it, stopping one tape, bringing one in and one coming out, I had no Pro Tools whatsoever [laughs], I had to do the whole thing manually. If something was eighty minutes long and something went wrong at minute 74 everything had to be redone from the very beginning! I want to come back to your quote. It sounds almost like a meditative approach—the idea that you ruminate and think over a piece in order to really hear the music before it exists. It could be so. I have been involved in the meditative process but this music had been called meditative before I started the practice myself. It was always there. Maybe I was more meditative then than I am now. Who knows? When you work on a major piece you said that you do the parts separately. How do you know one part belongs to the same piece? It goes with what I call the spirit of the piece. Let me give you a practical example of the Jetsun Mila piece, which is about the life of the great yogi and poet Milarepa. As far as I remember nine or ten men pass through his life, his birth, his ordeals. It has a spiritual or mental color and I have to translate this into certain kinds of sounds. Therefore, I made the sounds that fit with every shade. Sometimes, when this was too complex, I did some premixing to avoid being left with all the separate colors at the end. This was a framework, these pre-mixed pieces, which helped simplify my work. Jetsun Mila was the first piece of my trilogy on death and featured the six intermediate stages of consciousness, three during lifetime and three between death and rebirth, according to the Tibetan tradition. The story was there, I just had to follow it. I still work the same way now, although not so precisely, if I may say so. Can you give a recent example? A good example is my very last electronic composition L’île re-sonante. I had this island in mind—the title always refers to what it is—and L’île re-sonante belongs to Rabelais, the French Renaissance writer. The idea came when I was at a venue ran by David Vessel. The place was on a slope and, to me it looked like an island—in French: “île”. I’d also been thinking about the Lac du Bourjet in France—a lake that is very deep at a certain point, as deep as the mountain next to it is high. The piece refers to all these dimensions. The first part was to try to figure out how to represent the island and the mountain, the second part was about the water on which it reflects and the third part dealt with the inside, the depth. Every element had to have its own sound, so it sounds different even if it’s about the same thing. This is one of my main purposes of all the music I have been doing— it is somehow the same and also different. Here I would quote Verlaine, the French poet: “Et qui n’est, chaque fois, ni tout à fait la meme / Ni tout à fait une autre, et m’aime et me comprend.” It’s from “Mon reve familier”. What they say in America, albeit less poetically: same same but different. Yes. This is to explain what I mean by having something in mind before I start. There’s another funny story from one of my very good friends, Michèle Bokanowski, who is a very good composer and who asked of me for some sounds to use in her own composition. One day she arrived asking me to do some sounds that would represent the silence of the stars. Very nice, huh? So I went to my synthesizer and I tried to figure out something. I put the sound on, and she said: OK, that’s it. Bingo. We obviously had the same wavelength. Through music you can reflect anything. Sounds always reflect something from the mind. Perhaps because the human mind, much like music, possesses a mathematical component and a very irrational component. You cannot explain how or why a piece of music affects you. I think I am much more instinctive than that. I had been going for a while before I met Pierre Schaeffer and Pierre Henry and their work with twelve tones. That was intellectually very interesting, it was like a game for me, but I was not very happy with the sound, I was not fond of it. Twelve tone was one element of Pierre Schaeffer and Pierre Henry’s work but another was the way they included sounds recorded from tapes in the streets, enriching the music and, by extension, saying that these sounds were music too. Musique concrète became a revolutionary thing and, likewise, you worked with tape too. I haven’t been strictly following Pierre Henry or Pierre Schaeffer. They didn’t much like what I was doing because I was not faithful to their musical principle. I was happy to work with them and I have learnt quite a lot about musique concrète and how to splice tape through them, so I’m very grateful to them for that, it was a real pleasure. I respect them and I like their music. I like them as people and musicians. But I have my own music. There was some music I wanted to hear and to hear it I had to make it. It’s as simple as that. [laughs] That’s nice. I have a comment on the comment: There is a way of listening to every sound and making music out of it. The motor of an aeroplane, not from now because they’re too strong, but from years ago, had a very interesting sound that you could really make a symphony out of just by how you listened to it. So, I’d say: Yes, the way of listening is very important, so I agree with that person. Ideally, in order to avoid being annoyed by any kind of sound, you just have to make some music out of it through your ears, through the way of listening—if it is not too aggressive, of course. It’s interesting that you say you didn’t follow Henry or Schaeffer because what you just said about every machine, every noise, becoming music, it could have been them who said that. I think my meeting with Pierre Schaeffer was very important because it opened my life to that idea. When I expressed my dislike I was referring to the twelve tones music, I was unhappy with that. One thing about listening: when you listen to classical music there is a way of listening by reading the score at the same time. It’s very interesting intellectually if you want to make an analysis but the best way to listen is to just, you know, let the music go, be invited by the music. This is something important within my work because I’ve always worked very much alone, except for my cat for an assistant but she didn’t say that much. So I had several ways of listening—this is why it took a lot of time —from listening freely to technical listening, that is to say listening to the technical problems. You can listen to something ten ways at least. Everything I’ve ever done has been submitted to the different ways of listening, including distracted listening. What attracted you to electronic music? When I listen to your pieces I feel drawn to these abstract soundscapes you’ve created, they’re very long, very calm and modulated. As a composer you seem very patient with your music. It forces you to really listen. Of course you get more if you really listen. My music is always changing, and if you listen you can hear it. It comes from the first access I had to electronic sounds which was the wild sounds coming from feedback. When one sound is coming from one loudspeaker and one microphone it means that when you go too near to the speaker with the microphone everything collapses and when you go too far it disappears. If you find the right place, which is very narrow, then you can move it very slowly and it changes but that requires a lot of patience. The same with feedback through two tape recorders; just by touching one knob on a recording you may have some slight alteration, but if you go too far everything disappears. Even with my synthesizer I only had to move the knobs very, very slightly. This reminds me of the image of the river. It’s always the same river but at the same time always a different one. That’s true. I use this river image myself to represent one of my Adnos, of which I made three in the seventies. If a stone in the river moves, the river is not changed, but after a long time it becomes something completely different. Likewise, my music will always be changing but slowly. It’s rarely making great changes from one thing to another. You’ve started to work acoustically, which is quite a change. Do you ever perform anything on stage? Or are you simply playing a composer role? I don’t play any instrument. And if I was giving a concert on tape I would never be onstage. Once someone has claimed to have seen me onstage—but that person is a liar! I was always backstage. The final product has to be on tape because the mixing was so complex that it was impossible to reproduce it in a live concert setting. So, what’s the point of being on stage when everything is on tape? What I do is I insist on checking out the acoustic response in the venue, but I can do that in the rehearsal. Once that is done, that is it. Why did you start working with acoustic instruments? Acoustic instruments ask to be played, or else there would be no sound. It’s almost the opposite of what you were doing with your work with tapes. I am very grateful to Kasper Toeplitz who plays the electronic bass and who insisted for a long time on asking me to do a piece with him—which I enjoyed very much. It’s a wonderful experience to work with someone because, believe me, to work just alone can be very ascetic. I am grateful to him because it meant that when Charles Curtis, this great cellist, asked me I was able to say I’d give it a try. Since then I have only worked with acoustic musicians. There’s the same difference between acoustic and recording as there is between analogue and digital. There’s always something missing with digital, even if it is somehow cleaner and clearer. With acoustic instruments, let’s say a bell, when the first gong stops there’s a lot of different sub-harmonics that happen to make the music. Or, if you’ve just got the attack of the bell at the beginning you have a beautiful music just floating like that. This is a natural sound, nobody has tampered with it, it is just intonation all by itself. All acoustic instruments have that. Why would I do something which is quite difficult and painful if, at the same time, I have the privilege of having these wonderful instrumentalists asking to work with me? Particularly when I enjoy it so immensely. We can choose to work within a very narrow branch of music, but music is really so very, very large. 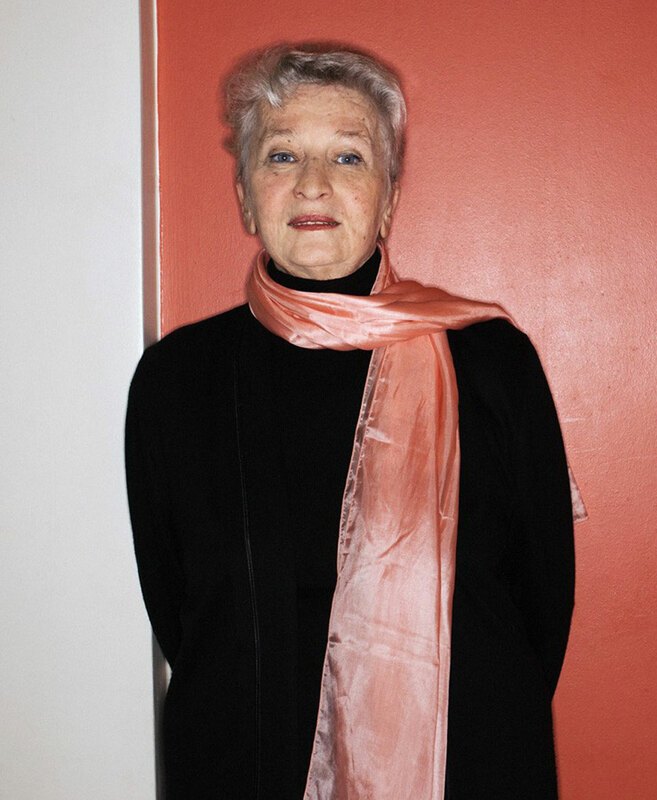 You can see Eliane Radigue play Berlin’s Berghain tonight, October 12, where she is taking part in Faithful! Festival.